Last year we set out to revamp our K9 Camera. The analog K9 Camera has performed very well over the last several years, but it was definitely time for some improvements. We reached out to the K9 community and asked what features the new camera should include and the response was a long list of requirements. While we had a big task at hand, we are very happy to say that the new CORE K9 Camera meets all of those requirements, plus a few more. Unlike the legacy K-9 Camera, the new CORE K9 Camera will include digital, HD video over an encrypted channel. The new camera is also waterproof and includes two-way communication. 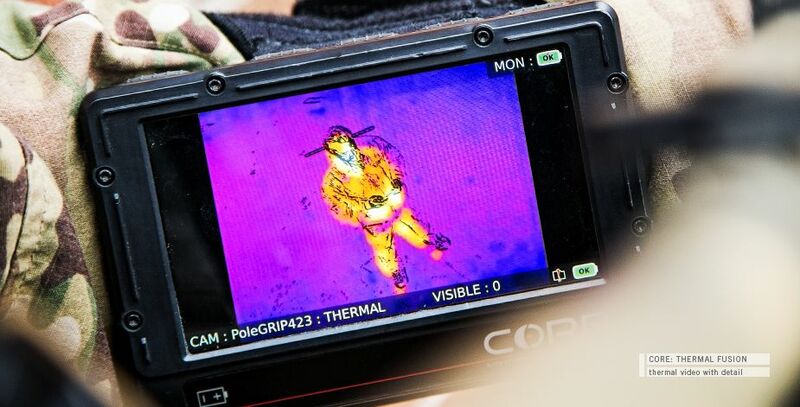 Most impressively, the new CORE K9 Camera will also include Thermal Fusion Technology. Read more about thermal fusion here. The new CORE K9 will include some of the great features of the legacy K9 camera to include recording capability and the spring loaded neck design. The camera in the new system is light sensitive and includes a high output IR illuminator to provide vision in low light environments. Size and weight are always crucial when equipping officers and operators. The overall size and weight of the new CORE K9 Camera is much smaller and lighter than the legacy K9 camera. We are also aware that you have many vest options for your K9 and they are not one size fits all, so we are developing several mounting options that will work with a variety of vests. Overall, the CORE K9 Camera is loaded with new technology and features that will aid K9 officers with situational awareness, evidence collection, search procedures, and training. Be the first to hear when the CORE K9 Camera is released by entering your email here.